Registration for the pilgrimage has closed since Monday, October 1, 2018 at 7:00 pm. Indeed, the Serena hotel is full. You can still register for the Retreat only: see Retreat page . 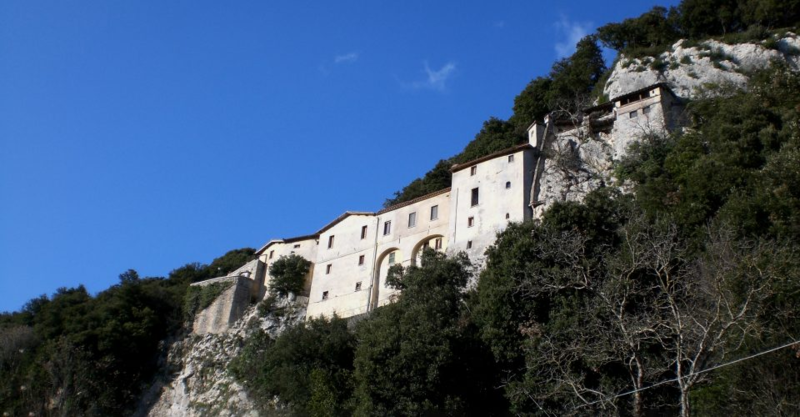 in the footsteps of St Francis of Assisi will precede the retreat: Swami Atmananda invites us to follow him on this pilgrimage to the Franciscan hermitages and sanctuaries of the Holy Valley of Rieti, where those who know how to come in silence can feel the atmosphere of the beginnings of Franciscan spirituality. Saint Francis stayed there several times, from 1217. The sacred beauty of these sites, still full of its Presence and perfectly harmonised with the surrounding nature, invites meditation, in union with one of the greatest mystics of the West. this pilgrimage will take place in a spirit of great simplicity. departure from ROME on 29th November around 2.00/2.30 pm. The meeting place is now specified (place accessible by public transport or taxi from the 2 main airports of ROME and from the station, including a coach parking lot) – NOTE: people arriving by car can park it in ASSISE and join ROME by this coach, because it will make the journey ASSISE-ROME empty, against a contribution to the expenses. See page : meeting point . return to ASSISI on December 1st around 12:30 pm, meal assured at Casa Papa Giovanni, then participation in the retreat. all other costs: accommodation and meals for the driver, donations during visits to Franciscan monasteries, tips to the driver, restaurants and hotel. deadline for registration: Monday 1st October (due to the limited number of rooms at the Serena Hotel, registration might be closed more quickly: 45 places only). by telephone, if you are not comfortable with the Internet: you can call us on +33 660 49 44 40 to arrange a later telephone appointment. We will proceed to your registration directly on our computer. If you wish to use the fastest and easiest procedure for you and for us, please bring your Bank Card with you. or by bank transfer: choose the option”Autres” (Others) when choosing the payment method (your registration will only be validated after receipt of the transfer or check, which we will confirm by email).